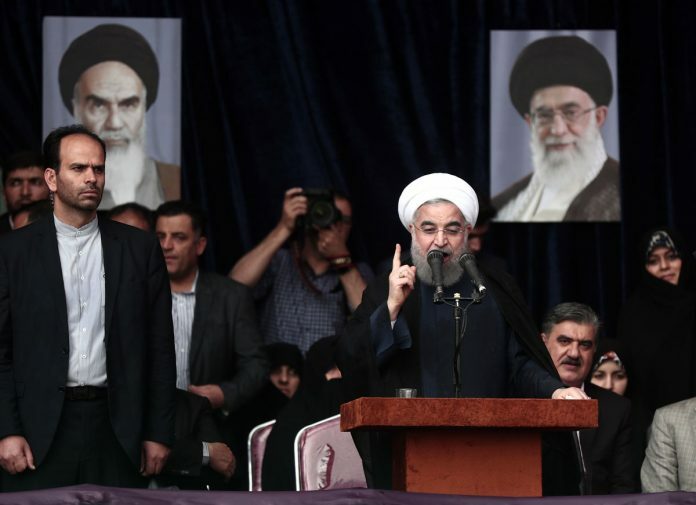 Friday’s election was widely seen as a referendum on the 68-year-old cleric’s push for greater freedom at home and outreach to the wider world, which culminated in the completion of a landmark 2015 nuclear deal that hard-liners initially opposed. The nuclear deal won Iran relief from international sanctions in exchange for limits on its contested nuclear program. But Iran continues to suffer from high unemployment and a dearth of foreign investment, putting pressure on Rouhani to show he can do more to turn the sluggish economy around. Rouhani highlighted his desire for further outreach – and with it, the prospect of creating jobs through outside investment – in his victory speech. “Today, Iran – prouder than ever – is ready to promote its relations with the world based on mutual respect and national interests,” he said in a televised addressed flanked by photos of Iran’s supreme leader, Ayatollah Ali Khamenei, and his predecessor, the late Ayatollah Ruhollah Khomeini, the leader of Iran’s 1979 revolution. Rouhani secured a commanding 57 percent of the vote in a race that drew more than seven out of every 10 voters to the polls. His nearest rival in the four-man race, hard-liner Ebrahim Raisi, won 38 percent of the vote, according to official tallies that covered more than 99 percent of votes cast. Although considered a moderate by Iranian standards, Rouhani was the favorite pick for those seeking more liberal reforms in the conservative Islamic Republic. He appeared to embrace a more reform-minded role during the campaign as he openly criticized hard-liners and Iran’s powerful Revolutionary Guard, a paramilitary force involved in the war in Syria and the fight against the Islamic State group in neighboring Iraq. That gave hope to his supporters, who during recent campaign rallies called for the release of two reformist leaders of the 2009 Green Movement who remain under house arrest. The two figures, Mir Hossein Mousavi and Mahdi Karroubi, both endorsed Rouhani, as did Mohammad Khatami, another reformist who served as Iran’s president from 1997 to 2005. Many female drivers held out the V for victory sign and flashed their car lights on highways to celebrate the win in Tehran’s affluent north. As night fell, tens of thousands of Rouhani backers celebrated by pouring into the streets of downtown Tehran, setting off fireworks and chanting in support of Mousavi. Many wore ribbons of Rouhani’s color purple as well as green in support of the opposition leaders under house arrest. Rouhani was first elected in 2013 with nearly 51 percent of the vote. Cliff Kupchan, chairman of the Eurasia Group, said the landslide win gives Rouhani a mandate he lacked in his first term. “Though he’ll remain a centrist, Rouhani will be more aggressive in pursuing reforms,” he predicted, though he cautioned the path would not be easy. Election officials repeatedly extended Friday’s voting hours until midnight to accommodate long lines of voters, some of whom said they waited hours to cast their ballots. Analysts said a higher turnout would likely benefit Rouhani. Rouhani’s first comment on the win highlighted the limits on expression that still exist in Iran despite his promises for greater openness. “Great nation of Iran, you are the winner of the election. I humbly bow down before you. I will remain loyal to my promises to you,” he wrote on Twitter, which is banned by government censors but followed widely by Iranians able to get around the curbs. Raisi, his nearest challenger, is close to Khamenei, who stopped short of endorsing anyone in the election. Raisi ran a populist campaign, vowing to fight corruption and fix the economy while boosting welfare payments to the poor. The two other candidates left in the race, Mostafa Mirsalim, a former culture minister, and Mostafa Hashemitaba, a pro-reform figure who previously ran for president in 2001, each garnered fewer than half a million votes compared to Rouhani’s more than 41 million. The Tehran Stock Exchange rallied after the election results came out, extending a recent winning streak to close nearly 1 percent higher at its highest level in three months. Iran’s president oversees a vast state bureaucracy employing more than 2 million people, is charged with naming Cabinet members and other officials to key posts, and plays a significant role in shaping both domestic and foreign policy. All candidates for elected office must be vetted, a process that excludes anyone calling for radical change, along with most reformists. No woman has ever been approved to run for president. Iran’s President Hassan Rouhani Secures Second Term. Friday’s election was widely seen as a referendum on the 68-year-old cleric’s push for greater freedom.